I never thought I would ride a train from Chicago to Washington D.C. to lobby on Capitol Hill. As part of the League of American Bicyclists’ National Bike Summit, I joined a delegation of Illinois cyclists who met with several senators and representatives to discuss three bills currently in Congress: the Bike and Pedestrian Safety Act, the Safe Streets Act and the New Opportunities (Equity) Act. We asked each senator or representative who was not already part of the Congressional Bike Caucus to join, and discussed other issues that might be of interest to them. One of my meetings was with my Representative Daniel Lipinski whose district includes part of the southwest side and many southwest suburbs, including the western end of the Cal Sag Trail route. He is a fellow cyclist who has historically been an ally on bike and pedestrian funding. I noticed his road bike, pump and related items in his office during our meeting. My other meeting was with Representative Robin Kelly. Her district includes much of the southeast side and many south suburbs, as well as the eastern end of the Cal Sag Trail route. We hope that she will become an ally and support bike and pedestrian projects and funding. Prior to Lobbying Day, attendees interested in lobbying were organized by state, with a designated coordinator for each state’s meeting. We exchanged emails prior to the Bike Summit and met at the end of the Bike Summit programming to confirm who would attend meetings with each representative and senator. We reviewed the details of each bill that we would be discussing in our meetings and who would cover various talking points in each meeting. The Bike and Pedestrian Safety Act is a revision to the highway safety improvement program. It would require the creation of separate goals and statistics for states for non-motorized and motorized fatalities and serious injuries. In recent years, the rate of fatalities for motor vehicle drivers and passengers has decreased, while the rate of non-motorized (bike and pedestrian) fatalities and serious injuries has stayed steady or increased. It’s important to create separate targets for bike and pedestrian traffic so that all states take the problem seriously and actively work to reduce these crashes. The Safe Streets Act would require all states to have a law or department of transportation (DOT) policy within two years mandating that federally funded transportation projects on roads that allow all types of users follow Complete Streets policies. It would also require a mechanism for assuring compliance. If roads are built to safely accommodate all types of users when they are first constructed or reconfigured, they don’t need to be rebuilt later to meet Complete Streets standards. Including appropriate features during construction usually adds little or no expense to the construction. Modifying existing infrastructure at a later date is significantly more expensive. This bill would help improve safety for bicyclists and pedestrians and get the most bang for the buck out of available funding. The New Opportunities for Bicycle and Pedestrian Infrastructure Financing Act would create a new source of funding (long-term low interest loans) for biking and walking networks. 25% of the funding must be spent in low income communities. It is a set aside from the $1 billion dollar TIFIA loan program funded in the MAP-21 transportation bill (which eliminated dedicated funding for bike and pedestrian infrastructure projects). You can use links attached to each of the bill numbers if you’d like to learn more and track the progress of these bills in Congress: Safe Streets Act (HR 2468/S 2004), Bike and Pedestrian Safety Act (HR 3494/S 1708) and New Opportunities (Equity) Act (HR 3978/ Senate bill to be introduced). The Summit is an annual advocacy event featuring panel discussions, presentations, and keynote speakers on a wide range of topics and included a Women’s Bicycling Forum. Terry O’Neill of the National Organization for Women was featured as a keynote speaker. She led a discussion on building coalitions to get diverse groups working together. A lunchtime keynote included Gabe Klein, former commissioner of the Chicago Dept. of Transportation, and Anthony Foxx, our new U.S. Secretary of Transportation. Each breakout session offered several choices, such as Overcoming the Scofflaw Perception, Bike Advocacy as a Political Platform, Quantifying Bike Benefits, Building a Broad Transportation Coalition, Moving Beyond the "Bikelash," the Role of Enforcement in a Vision Zero Strategy and Expanding Bicycling Options. I found myself wishing I had a clone or two, as there were usually 2 or 3 programs in each time slot that I would have liked to attend. A different mix of pop-up shops appeared each day in the hallway connecting event locations. Clarence Eckerson, the founder of Streetfilms, led a session on the basics of documentary film making. I hope to put that knowledge to good use. I gained a lot of helpful information from the event and made several valuable connections that I hope will be beneficial for future advocacy work. If you’d like to reinforce our efforts, please send your own message to your members of Congress. Use this link to ask your senators and representative to support the Bike and Pedestrian Safety Act. Feel free to use the following links to send messages requesting their support for the Safe Streets Act and the New Opportunities (Equity) Act. If they hear from you on these issues, your voice can help make a difference. I highly recommend the National Bike Summit to those who have a serious interest in advocacy work. It’s a great opportunity to take your work to the next level. 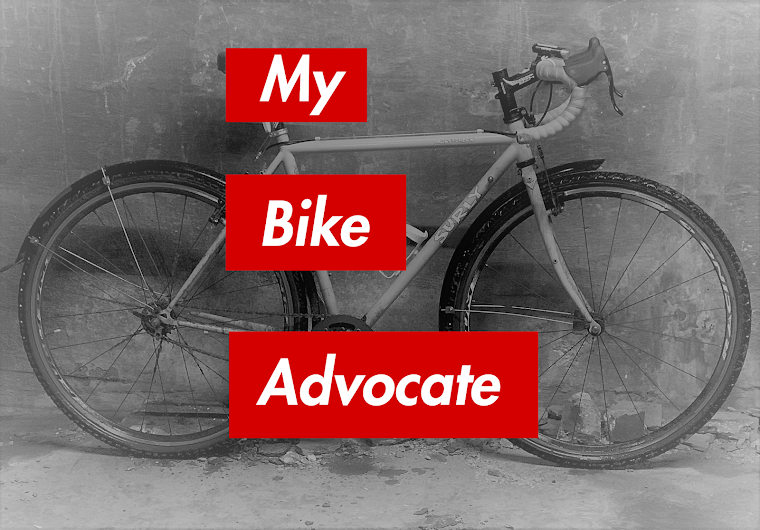 - Anne Alt is a paralegal at Freeman KevenidesLaw Firm, president of Chicago Cycling Club, board member of the ActiveTransportation Alliance, secretary of Friends of the Major Taylor Trail and a member of Women Bike Chicago. Labels: Anne Alt, Bike and Pedestrian Safety Act, New Opportunities (Equity) Act, Safe Streets Act, Washington D.C.